Road sweepers are an essential part of keeping our highways and the roads on and around construction sites clear. There are many health and safety benefits for doing this. Keeping carriageways clear of debris and a build up of dirt stops the degradation of the asphalt. The scheduled deployment of road sweepers stops roadside grids and drains from becoming blocked and prevents the build up of surface water. This improves the longevity of the surfacing, preventing the need for emergency repairs, it is also important to road safety by maintaining a surface which vehicle tyres can grip to. Better traction improves stopping distances and reduces accident risks. Busy large scale construction projects, especially those in cities and urban areas have a regular flow of traffic to and around the site. The nature of any construction process produces dirt, and this needs to be managed. This could be generated during the build, or from vehicles bringing materials onsite and removing waste. Large road sweepers patrolling the area stop the accumulation of surface dirt and atmospheric dust. It is essential to site safety and the wider environment that this is controlled. Go Plant road sweepers are vital to achieving this. 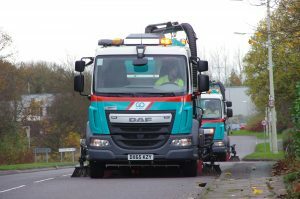 Go Plant are specialists in the provision of large road sweepers to local authorities and organisations in the public and private sector. High specification trucks carry sweepers and collection units with various capacities. Packed with features like left hand drive, lights and beacon packages, reverse alarms and extendable lances for water jetting, gully arms and air conditioning. We are confident you won’t find a better machine for your requirements. You have the choice of operated hire, short term hire or contract hire for your road sweepers. To discuss these options and for further information about our vehicles and services, please contact us.